Knowledge Base: How does the Output quality setting work in Movie Mode? Generic Device refers to other headsets than the Oculus Rift and Samsung GearVR headsets. Generic Device panoramas are rendered in Equirectangular format and are compatible with many third party VR viewers on Android and iOS devices. GearVR / Oculus refers to the Oculus Rift and Samsung GearVR headsets. 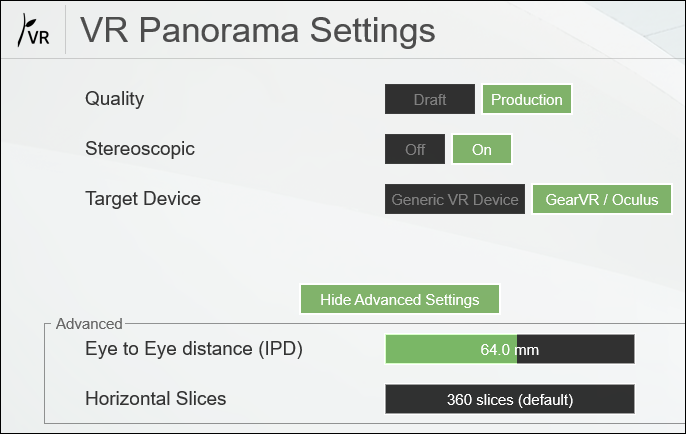 GearVR / Oculus panoramas are rendered in Side-by-Side Cubic format and are compatible with the official VR/panorama viewers for these headsets. When you turn the Stereoscopic option on in Lumion, two separate Panoramas will be rendered; one for the left eye and one for the right eye. The camera positions in Lumion for the left eye Panorama and the right eye Panorama are offset from each other by a few centimeters (to represent the distance between your eyes). When you open a VR viewer app while wearing your VR headset, the left eye Panorama is displayed on the screen for the left eye, and the right eye Panorama is displayed on the screen for the right eye. That way the brain is tricked into thinking that the VR Panorama is three-dimensional. If you turn off the Stereoscopic setting, only one Panorama will be rendered and it will be displayed on both the left and right screens on your headset. The result is that it will look 'flat', i.e. not truly three-dimensional. Eye to Eye distance (also known as "Inter-pupillary distance" or IPD) is the distance between the pupils of your eyes measured in millimeters. It may be necessary to adjust this slider if a child wears a VR headset because the distance between a child's eyes is less than for adults. However, for adults there is rarely a need to adjust this slider value. The Horizontal Slices setting is a quality setting. When you render a Panorama image, you will notice that Lumion renders the image in vertical slices. 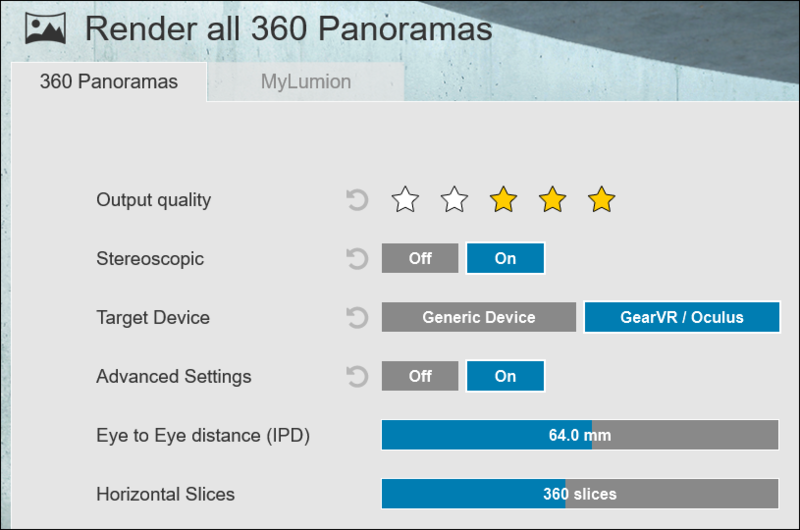 The higher this slider setting is, the longer it takes to render a Panorama but the better the quality will be. Reducing the Horizontal Slices value can greatly reduce the render times. The fewer slices you pick, the more likely you are to see slight mismatches along the borders of the slices as objects that are close to the camera might be offset a little bit between two neighboring slices. If objects are not close to the camera, fewer slices usually works fine. Production Quality renders better reflections, OmniShadows, anti-aliasing, glass as well as volumetric effects such as Volumetric Sunlight, Volume Clouds etc. In Draft Quality, some of those elements are scaled down and others are disabled entirely. Draft Quality renders much faster, so if you are happy with the results, then use that setting. See the guidelines in section 1 above. ©2018 Act-3D B.V. Product information and specifications are subject to change and provided by Act-3D, B.V. “as is”, without any warranty of any kind, either express or implied. All trademarks are the property of the respective trademark owners. For more information click here.